Storm, was Melissa's dream dog that she wanted since she was a little kid. This long coat ball of fluff wants nothing more than some quality time, a pat and a few treats while you’re at it. I had a dream, and the german shepherd in it, was named Storm. Storm is out going, full of energy and a real happy dog. She enjoys sleeping at our feet while we watch a movie and LOVES walks. Even though Storm is a big dog she really is a gentle giant. Storm is Brian's 'heart dog', a cherished member of our home and called 'big mama' of our pack. Storm loves water, chasing balls and simply being everywhere Brian goes. The breed, GSD, is not something we will heavily involve ourselves in. Goofy and fun loving, outgoing and beautiful ... everyone who met her loved her. We attended OB and Storm LOVED travelling, she would get so crazy excited if you started to prep the trailer for travel. Gee she had a 'whine' on her - could be a big sook when excited. Storm was a Delta Therapy dog for a little while and did so well. Our constant and dependable companion - that's all we ever wanted and she never disappointed.
" Veterinary Report: Storm Borg. 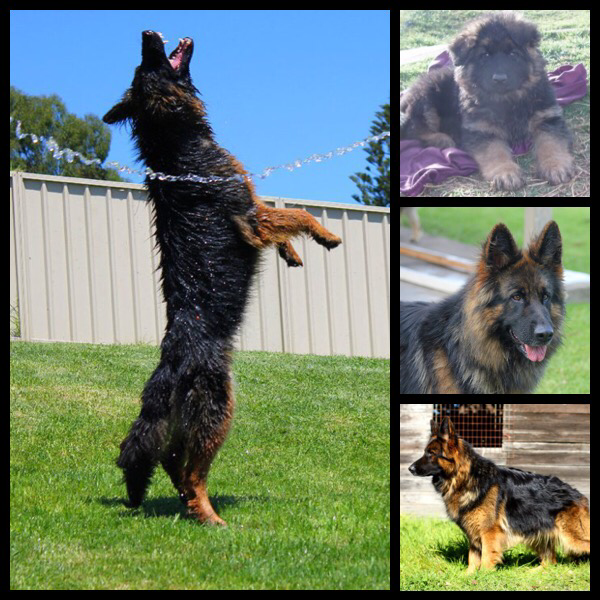 On 9th December, 2016, I examined the German Shepherd “Storm”, owned by Melissa and Brian Borg. Storm had been seen previously by Sue Cook, another vet here, earlier in the evening. She presented with neurological signs, and was treated with diazepam. After getting home, the neurological signs progressed. - Absence of menace response, though she did appear to have vision. - Episodic “Schiff-Sherrington” signs: increased muscle tone in her front legs, whilst back legs had reduced muscle tone. - Inability to stand; reduced proprioceptive positioning when her weight was supported. - Reduced pain sensation in all feet. Some of the neurological signs would have related to the diazepam given earlier in the evening. She also had a very fast heart (200bpm), with a weak pulse. I discussed referral to a specialist centre with Brian, with the potential for 24hour monitoring and brain imaging, but he declined, based on guarded prognosis and cost. I therefore recommended symptomatic treatment in hospital, with intravenous fluids, antibiotics, and intravenous cortisone. She appeared relatively settled in her hospital bed. At recheck at 11pm she had died. She appeared quite peaceful and was in the same position as when I’d left her. She was still warm; in fact her rectal temperature was 42.8. I performed a post mortem, after discussion with Brian. Storm had a relatively well advanced, metastatic cancer within her lungs. This most likely related to breast masses removed last year. Even though chest x rays at the time were clear, it is likely microscopic spread had already occurred. How this relates to her presenting signs is unclear. It is possible the tumour induced an arterial embolism, which affected her brain. Another possibility is bacteria seeding into her bloodstream, related to the gall bladder disease, though I think this is less likely. Gall bladder infections are uncommon in dogs, and in my experience, are more likely to occur in dogs with Cushings syndrome. Unfortunately a definitive diagnosis may not be possible without histopathological examination of tissues; even then it may not provide a diagnosis. What is sure, however, is that the metastatic lung tumours would have come against her in the short term, even without the neurological catastrophe.